Machine for making cards for carding cotton, late nineteenth or early nineteenth century. A machine for making cards for carding cotton. 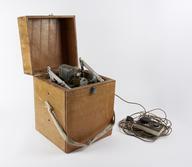 Kay's Machine for making cards for carding cotton, late nineteenth or early nineteenth century.